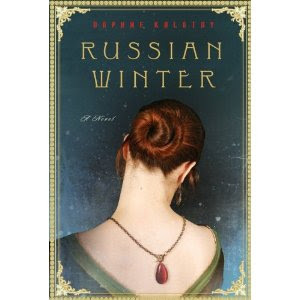 Russian Winter is Daphne Kalotay’s debut novel and in some aspects this is apparent in her writing. The story centers around three people but four characters: Nina Revskaya, a retired Bolshoi Ballet star living in Boston; Drew Brooks, an associate at the auction house Nine has placed her extensive jewelry collection into the care of; Grigori Solodin, a university professor whose work specializes in the poetry of Nina’s late husband; and the young Nina, a gifted ballet dancer in Communist Russia. The tie that brings all four of these characters together is the magnificent jewelry collection of the older Nina that she has decided to auction off to benefit the Boston Ballet Foundation. At the very beginning of the book this quote appears, “Her husband had archaic ideas about jewels; a man bought them for his wife in acknowledgment of things he could not gracefully utter.” In such a way, several of the pieces featured in the auction are linked to the story of Nina’s life, with one set in particular taking center stage: an amber bracelet and earrings each with a unique inclusion (a small object, usually an insect, embedded in the amber). The parts of the book detailing the methods used to date and appraise the jewelry are interesting but occasionally tedious. Line drawings might have helped clarify the more technical aspects of description. One tell of this author’s newness to the genre is her efforts for sophistication by frequently holding back details in the story. She uses this mechanism so often and at times delays the revelation so long that the reader feels like the author is holding out against them rather than giving the reader clues to help them put together the puzzle. A minor example would be on page 18 with a paragraph that opens with the sentence, “Grigori Solodin saw the announcement on the third day of the new semester.” The reader’s interest is piqued, but it is not until two pages later that their curiosity is satisfied as to what the announcement is! The biggest mystery of the book surrounds an amber pendant in the possession of Grigori, who thinks that the necklace might be a match to Nina’s amber set. The reader is kept in suspense as to what this large amber drop contains for the majority of the book so that when the secret is finally revealed it is almost anticlimactic. At the beginning of the story each person is introduced as broken and dealing with a significant loss, Nina lost in her memories and regrets, Brook recovering from a severed engagement and Grigori mourning the death of his beloved wife. As these three characters interact, deeper layers of connection are shown to already exist between them. This is where another significant mystery enfolds. The reader is stymied with all the hints and questions that arise from the narrative. How are Grigori and Nina really connected? Does his pendant actually match her amber set and how did the pieces come to be separated? Who does Brook remind Nina so strongly of? The story of young Nina, as she discovers the world of ballet and rises through the ranks until she is the prima ballerina of the Bolshoi Ballet, is a fascinating look at Communist Russia, especially the world of the artist in that regulated time and place. The author is not so detailed with the phraseology of the ballet that the reader loses interest but instead gives a beautiful picture of glittering performances while also showing the drab realities of life behind the glamour. Before reading this book, I enjoyed the occasional ballet but I have now been inspired to more purposefully explore and learn about this beautiful art form. For such an avid lover of mysteries as I am, I anticipated liking this book much more than I actually did. Some of the author’s literary devices seemed to hinder the story so that I occasionally had to force myself to keep reading until the flow was regained. For instance she seemed to touch on the each character two or three times within each chapter, which made their stories seem stilted. There are also few parts that stretch the reader’s imagination a bit and a few passionate scenes that are a little detailed for my taste. And if the ending seems to come upon the one rather abruptly, at least the author managed to clear up most of her hinted at mysteries by the last page. Leaving aside my difficulties with the author’s style, for an interesting look at the worlds of ballet, Stalinist Russia, and the history of jewelry, this book should be a pleasant read for any patient reader. Thanks to Harper Perennial for shooting a copy this direction. All opinions expressed above are my own. And Joy's. Thanks for sharing, Joy! I read this last year and while I actually enjoyed most of the book I was extremely disappointed with the abrupt ending. Not one that I go around recommending. Happy reading! I was curious about this one as well...but thanks to this honest review...may skip it as well!! Thank you! I have several book-loving friends, too. I enjoyed Joy's thoughts...though, like you, I can't say I'm ready to read this one. Sounds like the premise is good but the execution needed a little more work. I guess one can make allowances for a brand new author? Yes, it's always such a disappointment when you think there is so much potential but the execution puts you off. I'm tempted by the subject matter.I mean, ballet and jewelry, come on! But I don't think I'll be giving it a shot. I so wanted to like this book because the plot sounded like some I should like, but I couldn't get interested in it so back to the librayr it went.